WELCOME TO MY ARTBLOG! I dedicate this blog to the infinite WISDOM, CREATIVITY, and SACRED DREAMING POWERS of my ANISHINAABE ANCESTORS. They knew that everything in Creation has MANIDOO, or SPIRIT. The PLANTS, the TREES, the WATER, the WIND, the ROCKS, the MOUNTAINS have MANIDOO. The SKY SPIRITS have MANIDOO. I try to put some of that MANIDOO in my jewelry creations and in the TEACHING STORIES that I share along with my art and that of kindred artists. MII I'IW, CHI-MIIGWECH. Boozhoo, aaniin! Biindigamig miinawaa nindaadizooke-wigamigonaan. Ninga-aadizooke noongom giizhigad. Today, we present part 8 of a new blog series connecting our jewelry and paintings with stories and teachings inspired by the Prophecy of the Seven Fires of the Ojibwe Anishinaabe People. These and other Grandfather Teachings, kept safe for thousands of years by countless generations of Medicine People of the Midewiwin lodge of the Anishinaabe Peoples, are passed down orally, through songs, and from the sacred birch bark scrolls that still exist until today. The designs of both wedding ring sets that you see on this page are inspired on a dream the bald eagle once had, about how she recovered the old ways and the language of the Anishinaabeg Peoples. 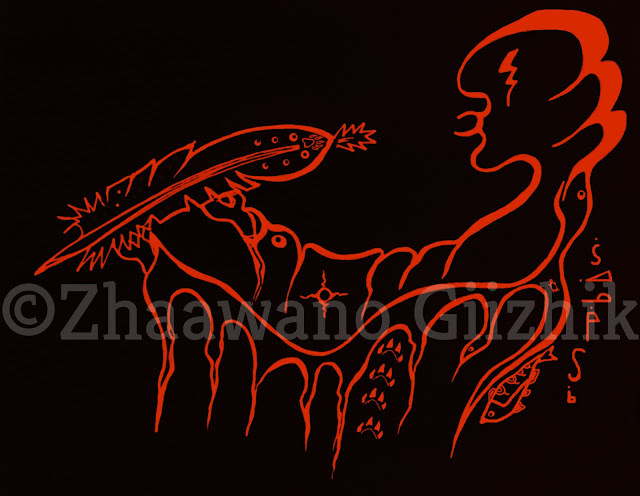 Loosely based on the tale "Migizi Finds The Dawn" related by Maya Chacaby, it is my personal version of a widely known aadizookaan (sacred story) that has been told by many storytellers in many different ways. * The story is aided by two magnificent paintings by my good artist friend Simone McLeod; the way I see it, the vivid compositions and colors and the inherent message of her works of art always attune beautifully to, and complement with, the themes and subject matter of my blog stories. 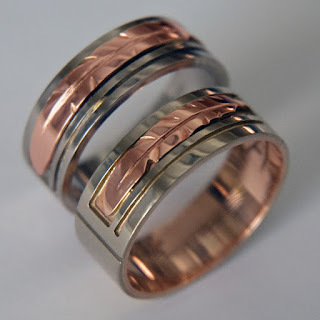 Migizi Bawaajigan ("Dream of the Bald Eagle"), wedding rings by Zhaawano Giizhik. 14K white gold on oxidized sterling silver overlay, feather inlay of 14K red gold. Photo by Zhaawano Giizhik. See the website to view details of the above wedding ring set. Many moons ago, in the time that has become known as the Sixth Fire, Migizi, the Bald Eagle, beheld an izhinamowin (vision). In this izhinamowin, she saw that the Anishinaabeg were living all over the earth. One day, they stopped living together. They stopped giving thanks and properly speaking Anishinaabemowin, the language of their ancestors. They lost track of mino-misko-manidoo miikana, the good red spirit road. As she was circling high in the sky, it became clear to Migizi that the promise of the Fifth Fire had indeed come in a false way and the near-destruction of the Anishinaabe way of life seemed inevitable! Sadly, Migizi saw that children were taken away from the teachings of the Elders. Grandsons and granddaughters turned against the Elders. The Elders lost their reason for living and their purpose in life. A new sickness came among the people and the balance of many people became disturbed. Still circling high, Migizi saw that the Manidoog (Spirits) that inhabit all four corners of the Earth became alarmed and as they moved about the Earth they called the Anishinaabeg, but no one answered. The sacred waterdrum had stopped sounding its mighty voice across the lakes and hills and river valleys and even the echo of its pulse had ceased from the Spirits’ ears. Anishinaabeg had turned their back on the ways of the Midewiwin and they had forgotten the lessons about bimaadiziwin (how to live a good life). The Spirits realized that the Anishinaabeg had left the good red road and forgotten where they came from. They had forgotten how to speak Anishinaabemowin properly, the language of the ancestors had become strange to their ears, nor could they make their own words understood by the ancestors. The Anishinaabeg had even become deaf to the voices of the Manidoog! Izhi-Migizi-Waabinaa ("Vision of the Eagle"), wedding rings by Zhaawano Giizhik. 18K palladium white gold, 18 K red gold, feather inlay of 18K red gold. Photo by Zhaawano Giizhik. Click here to see more wedding ring designs by ZhaawanArt. In her vision, now being very worried because of what she saw beneath her, Migizi noticed that the Manidoog decided to hold a meeting. They talked for four days and while they were talking, everything in Creation stopped working. Every living Being, even those that lived beneath the Earth and the lakes and the rivers - yes, even the jiibayag, the Spirits of the Ancestors - wondered what was going on. Everyone asked Nookomis Migizi, the Grandmother eagle, to ask the Manidoog about what was happening. Hereupon the Manidoog reached a decision: they gave Grandmother Migizi four days to look for Anishinaabeg who remembered their teachings and their language. Still dreaming, Migizi started her journey from her abode in the east to look for someone who could speak the language and remembered their responsibilities. On the first day, Migizi flew to the south, but she could not find anyone who remembered their responsibilities. On the second day, Migizi flew to the west, but she could not find anyone who still remembered their responsibilities. On the third day Migizi flew to the north, but she could not find anyone who still remembered their responsibilities. At the dawn of the fourth day, Migizi flew east again. The vision had made her very tired but she knew she couldn´t rest now. Suddenly, she saw smoke rise up from the bare ground. Migizi flew toward the smoke. As she got closer, she could hear an Elder. Upright then may be our lives." Upon hearing the Elder praying and giving thanks in Anishinaabemowin, Migizi, happily, still dreaming, quickly returned to the Manidoog. As soon as Migizi related to them what she had seen in her vision, the Manidoog understood that there was still hope for Anishinaabeg. They saw that a New People would emerge who would retrace their steps to find the wisdom that was left long ago by the side of the good red road. They also saw that the continuation of their language was ensured. The world could begin again. 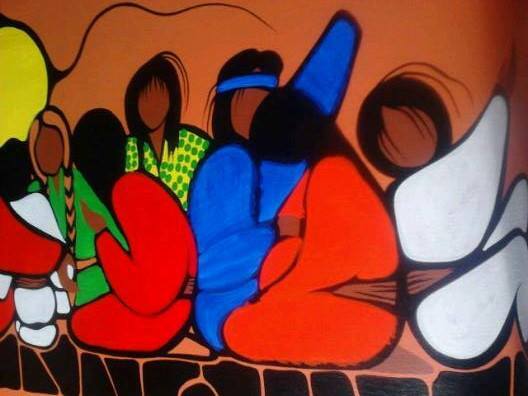 Fragment of the (still unfinished) painting "Zhawendaagoziwag Waabooyaanininiwag" ( "Blessed Are The Blanket People") by Simone McLeod, acrylic on canvas, 2013. 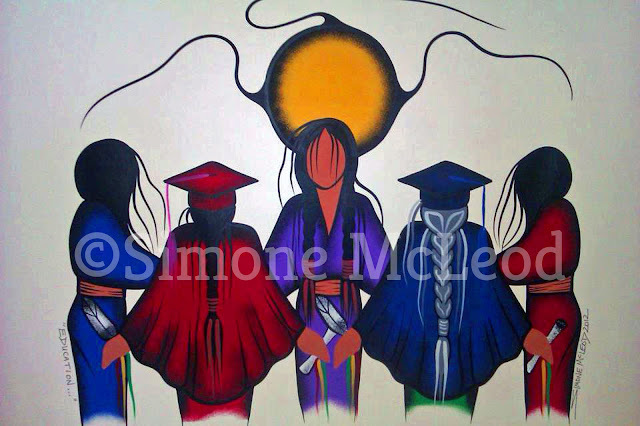 The undone view, or the part of the painting that is not shown in the image, pays honor to the future visions and dreams of the Anishinaabeg Peoples. The pregnant woman in the light red dress in the foreground is a symbol of hope for a better future for her People. It was this vision prompting Migizi to find the dawn that marked a new beginning for the Anishinaabe Peoples. Thanks to Migizi and the Manidoog, the Anishinaabeg realized it was time for them to take their responsibilities and light the Seventh, and perhaps even the Eight Fire. The time had come for the young to ask the Elders to guide them into finding back bimaadiziwin and mino-misko-manidoo miikana, the good red spirit road. The time had come for the People to return to their language and live a life that is truly spiritual! “In a sacred way I hold this feather. it shall symbolize human life itself. The quill symbolizes the life path. Each strand stands for a lesson. Will speak honestly from his heart. Both sets of wedding rings displayed on this page were constructed with the aid of the overlay method. Overlay type of jewelry, a fabulous technique originated around 1940 in Arizona by Hopi silversmiths, is produced by soldering two pieces of silver (or one piece of gold and one piece of silver or two pieces of gold) together. In case of my overlay jewelry it means that, with the aid of a jeweler’s saw, a design is cut out of one sheet of precious metal and the cut sheet is then soldered onto another plate of precious metal. These wedding rings for example, are constructed of an exterior of 14K white gold with a feather design cut out, and an interior of sterling silver. The cut-out area was filled (inlaid by soldering) with several pieces of 14K red gold. Next, using a rocker graver, I created a decorative zig-zag pattern on the visible areas of the lower sheet (the interiors of the rings); then I oxidized (chemically blackened) these areas to produce a contrasting background against the white gold ring surfaces and the red gold feather inlays. Finally, a matted, or in this case, a high polish is put on the raised surfaces of the near finished rings. This, in combination with the darkened recesses, creates the illusion of depth, and adds a rather pronounced, almost three-dimensional quality to the overall feather designs. The stylized eagle feathers of the wedding rings image and harbor the migthy spirit and vision of Migizi, the White-headed Eagle who lives in the East. The white gold of the rings symbolizes waaseyaaban (the light of dawn), while the red gold feather inlay refers to mino-manidoo miikana, the good red road that emerges from the dark of the night as natural and powerful as the sun rises in the east (the blackened background of the feather design symbolizing the dark past of the People). The color red also symbolizes the fire that Migizi saw in her dream, tended by the Anishinaabe Elder praying and giving thanks, and, in doing so, safeguarding and maintaining the old ways of the Midewiwin for the future generations. These unique wedding bands, constructed by hand, feature a sleek and modern design of 18K red gold eagle feather inlaid in 18K palladium white gold; the interiors of the rings consist of 18K red and palladium white gold. 18K palladium white gold is heavier in weight, and has a darker color and an even more grayish luster, than 14K palladium white gold; 18K red gold has a slightly more yellowish color than 14K red gold. The warm color of the red gold eagle feather inlays provides a dramatic contrast with the rather cool character of the palladium white gold ring shanks. The wedding rings tell the above-told aadizookaan (traditional story) of how the bald eagle returned the language and the old ways to the Anishinaabeg Peoples. 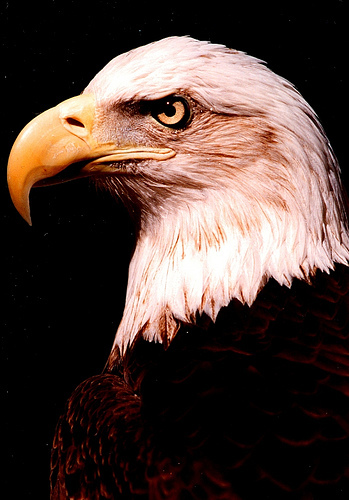 The stylized eagle feather of red gold represents the spirit and the vision of the bald eagle. The straight line that runs parallel with the cut out rectangular recession holding the eagle feather, images the spiritual road that leads to mino-bimaadiziwin, a better life for the People and the generations to follow. Giiwenh. Miigwech gibizindaw noongom mii dash gidibaajimotoon wa’aw izhinamowin. So the story goes. Thank you for listening to us today, to let us tell you about this sacred dream. >Click here to read the next episode of our “Teachings of the Eagle Feather" series. _______________________________________________________________________________ *Kipimoojikewin: Articulating Anishinaabe Pedagogy through Anishinaabemowin (Ojibwe language) revitalzation by Maya Chacaby. A thesis submitted in conformity with the requirements for the degree of Master of Arts, Graduate Department of Adult Education and Counselling Psychology Ontario Institute for Studies in Education, University of Toronto 2011. **Fragments of the Seventh Fire Prophecy, which according to Midewiwin sources had been delivered a long time ago by Prophets from the east. These Prophets had stated that the Fifth and Sixth Fires would mark decades of false promises and near-destruction of the old ways, but that in the time of the Seventh Fire a New People would emerge who would eventually find back the good red road and the ways of the Midewiwin. Source: Benton-Banai, Edward. The Mishomis Book - The Voice of the Ojibway. (St. Paul: Red School House publishers, 1988). *** Bulletin 45 of the Bureau of American Ethnology, p.24. Simone Agnes McLeod (her traditional name is Aki’-egwaniizid, which is an Ojibwe name meaning "Earth Blanket") is a Nakawe-Anishinaabe painter and poet, born in Winnipeg, Manitoba in 1962 and a member of Pasqua First Nation in Saskatchewan. She belongs to he Name doodem (Sturgeon clan). Simone feels special kinship with her mother's people, the Azaadiwi-ziibi Nitam-Anishinaabeg (Poplar River First Nation) of Manitoba. Simone descends from a long line of Midewiwin seers and healers and artists. Her artwork has been appreciated by several art collectors and educational and health care institutions from Canada, as well as by art lovers from all over the world. Zhaawano Giizhik, an American currently living in the Netherlands, was born in 1959 in North Carolina, USA. Zhaawano has Anishinaabe blood running through his veins; the doodem of his ancestors from Baawitigong (Sault Ste. 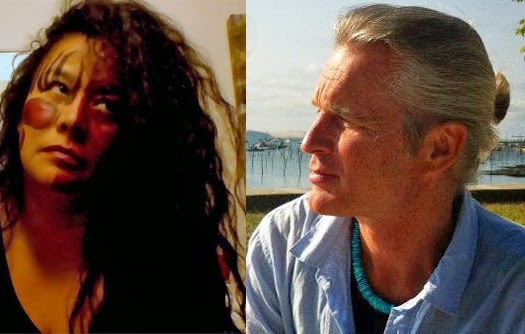 Marie, Upper Michigan) is Waabizheshi, Marten. As an artist, a writer, and a designer of Native American jewelry and wedding rings, Zhaawano draws on the oral and pictorial traditions of his ancestors. In doing so he sometimes works together with kindred artists. He has done several art projects with Simone and hopes to continue to do so in the future. Copyright by ZhaawanArt. Awesome Inc. theme. Powered by Blogger.